Glacier Ghost - The ice gives up the bodies—and the secrets—of the past. Glacier Ghost – The ice gives up the bodies—and the secrets—of the past. Jan Theiler works at the top of a mountain in Switzerland that has been made safe for novice skiers and walking tourists, and part of his job is to make sure it remains that way. In the middle of the summer of 2017, a tower holding a ski lift above one of the intermediate trails had drifted slightly out of position, which was neither unexpected nor uncommon because both the tower and the trail are built on a glacier, and glaciers move. It does not matter that the ice has been tamed and groomed and that snow buses haul people across it to a monolith tottering at the edge: Beneath the surface snow, the glacier is constantly in motion, flexing and flowing with such force that anything on it, or under it, or in it, is going to move, too. Usually the movements are imperceptible. Like stop-motion photography, the shifts and lurches aren’t apparent until the frames are played back at speed. In 22 years working on the glacier, Theiler has seen the gradual but dramatic changes, the way it recedes year after year, the summer meltwater outpacing the winter snowfall. The slab creeps across a little less of Les Diablerets, a massif in the Alps of western Switzerland, each year, the blue-gray of the edges swirled like a tide pool on limestone slowly exposed by the seasons. Theiler needs the big machine to nudge the tower back in place, the 34-ton Caterpillar parked near the bottom of the run. He drives one of the snow buses across the glacier, big treads churning through the midsummer slush. Ahead, in the light of the late afternoon, he sees a dark patch that hadn’t been there a few days before. He thinks it looks like mud. The treads claw forward. No, it isn’t mud. Too lumpy. Rocks, Theiler decides. But how odd, he thinks, a clutch of black-brown rocks materializing at 2,600 meters, and tightly clustered, as if they’d been deliberately arranged. He crawls closer in the bus. There is white space between some of the rocks, a background that makes the outlines clear. The first rock is long and narrow, until Theiler realizes it isn’t a rock at all. It’s an umbrella. He gets out of the snow bus. He sees a bottle made of dark green glass, and it is lying across the toe of what appears to be a woman’s boot. A few inches to the right, there is another boot, the bottom facing him so he can see the hobnails hammered into the sole. Long black appendages leak out of the boots, twisting down into the ice; they’re covered in woven wool hose, so finely preserved he can make out the pattern. There is another boot, too, a man’s, sticking straight up, sole to the sky. And in the middle of those boots is a lump, which Theiler recognizes as a head. It is a deep, leathery brown, the color and texture of a ham left too long in the smokehouse, but he can tell it’s a head because it has a face. The eyes are sunken and the cheeks are drawn, but it is obviously, unmistakably, a face. The glacier where Theiler found the bodies is called Tsanfleuron, which in a mountain dialect translates to “field of flowers” and which, according to local legend, is what it used to be. There are several stories of how a meadow became a slab of ice—a miserly shepherd might have brought a curse upon the place, or the Devil himself might have frozen it out of spite—but the specific origin isn’t the important part. Those tales were first told hundreds of years ago, when the western tip of Switzerland was poor and life was a struggle and there wasn’t much to do at night except look at the stars and make up reasons to explain the apparently unexplainable. That not everyone heard the same story is not surprising. The important part is that all those stories end basically the same way, with the glaciers atop Les Diablerets being a place where devils and demons cavort and the damned do their penance. Once upon a time, this would have been perfectly obvious. Terrible things came from the high mountains. Walls of snow thundered down in the winter, burying cows and crushing chalets and smothering peasants. In the summer, rocks tumbled from the peak, sometimes even cascades of limestone collapsing as thick and fast as a winter avalanche. And always there were noises, bangs and creaks and snaps. Those were said most often to be the devils at play, hurling stones at the monolith, a huge and curious rock more than 50 meters tall and seemingly balanced on end. Cartographers call it the Tour St-Martin, but no one else does. It’s the Quille du Diable, the Devil’s Bowling Pin, a target for supernatural games of skittles. There were lights, too, in the passes and at the peak, which were assumed to be lanterns carried by the unholy. Those lights, in the retold memories of generations, burned especially bright on a September night in 1714, right before tons of the south face of Les Diablerets fell onto the village of Derborence. A priest came from Ardon to pray away the evil, and counted the dead and destroyed: 14 people and 55 chalets. Years passed and eventually the mountains were climbed and charted, mostly by Englishmen on holiday. No one ever saw any demons, but that hardly mattered, since demons typically wouldn’t show themselves to mortals, anyway. Or maybe they weren’t real. But so what? Snow still exploded down the slopes, and rocks still tumbled into the pastures below. Did it matter if they were tossed by demons? The mountains were still a wicked place. Jan Theiler had never found a body, let alone two, poking out of the ice. But he was not particularly disturbed. For one, they clearly had been there for many years: The style of the boots and the bottle suggested decades. And everyone knew people have gone missing on this mountain, especially years ago, when the ice was much thicker and crevasses much deeper. There was even a plaque bolted to the monolith at the edge: MARCELIN ET FRANCINE DUMOULIN, it reads. DECEDES ACCIDENTELLEMENT. LE 15 AOUT 1942. More to the point, it was more common than one would imagine for long-dead bodies to surface in melting glaciers. Almost exactly a year earlier, in July 2016, the remains of a German skier missing since 1963 were found on a glacier in eastern Switzerland, near the Italian border. The year before that, two Japanese men who tried to climb the Matterhorn in 1970 were found far down the mountain. In 2012, the skeletons of Johann, Cletus, and Fidelis Ebener turned up on the Aletsch glacier, 86 years after they vanished. And Theiler couldn’t know it yet, but a month later a German hiker last seen in 1987 would be dug out of another glacier in Valais, the same canton where he found the two bodies at the bottom of an intermediate ski run. People have been disappearing on glaciers for as long as people have been walking on glaciers. And for most of human history, they were simply gone, vanished, entombed in a hopelessly deep, dense river of ice, carried away by a slow, grinding current. How many, no one knows, because that number is lost to time. For a benchmark, though: Since 1925 (when records first began to be kept), almost 300 people have disappeared in Valais alone, though not all, of course, on a glacier. And maybe none of them would have ever been seen again. Except then the world got hotter, and the glaciers got smaller, thinning and retreating, and now, after decades, centuries, millennia, they’re slowly surrendering the dead. This is not peculiar to Les Diablerets, obviously. 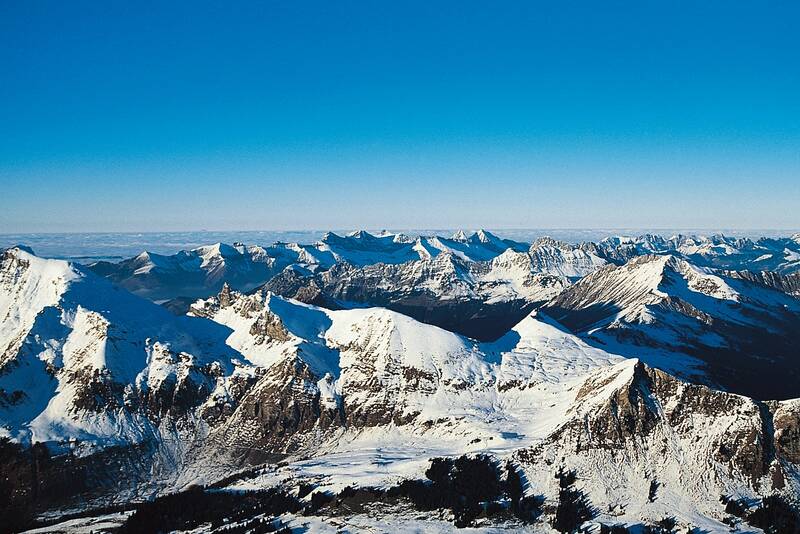 Glaciers all over the planet are receding at alarming rates, some more than others. The thaw is catastrophic, and global. As they melt, the ghosts of the past are returning, and the present is that much more haunting. When he found the bodies, Theiler called security at Glacier 3000, the company that runs a resort on Les Diablerets, and security called Bernhard Tschannen, the CEO. It was a Thursday evening, July 13, 2017, and Tschannen was at a birthing class with his wife, who was seven months pregnant with their first child. Tschannen stepped outside to take the call. The security officer told him a worker found two bodies on the glacier. Even in the summer, thunderheads can gather quickly in the east and drag over the peaks, and fog can descend fast and viscous. The effect is utterly disorienting, every landmark erased, no spatial cues, not even footprints, to confirm that you’ve turned one way or another. The visible world restricts to inches, which is a dangerously short distance at 3,000 meters. It was more dangerous eight decades ago, or ten, or a thousand, when the glacier was still massive, a wide, fat sheet deep as a frozen lake, gouged with cracks 30, 40, even 50 meters deep. One step in the fog could easily be a step into oblivion. Which is what most likely happened to the mummies at the bottom of the intermediate slope. Seeing as how no one was in immediate peril, Tschannen waited until daylight to contact the authorities. Police from Valais choppered up with chain saws and a crew to cut a big block from the glacier, keeping the bodies encased until they could be thawed and examined and positively identified. But everyone had a pretty good idea whom they’d found. The clothing and the artifacts—the bottle, the cowhide rucksack, the watch still shiny in the pocket of the jacket still on the shoulders beneath the head—suggested these people had died decades ago, probably around the time of the last great war. Their names might even be the ones on the plaque bolted to the Quille du Diable. 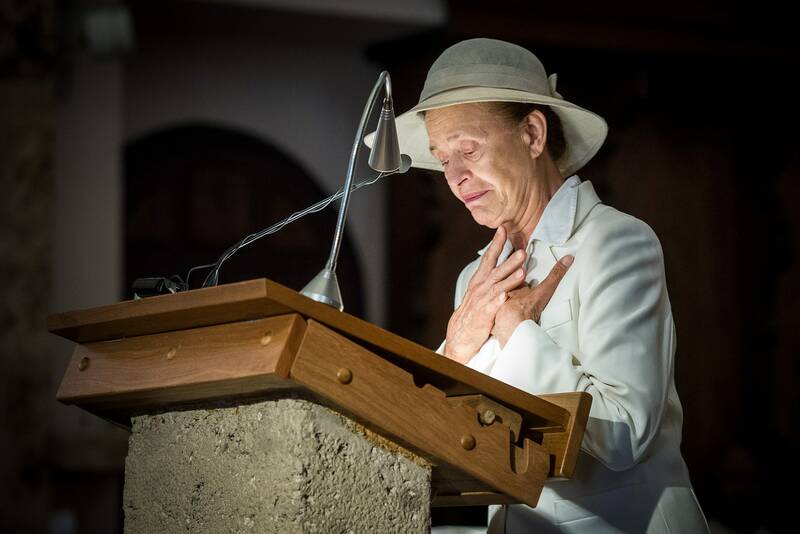 Les Diablerets is a place of legends and stories, and Marcelin and Francine Dumoulin were one of them. The Monday after the bodies were extracted from the ice, Marceline Udry-Dumoulin was in her garden in Chandolin, one of seven hamlets that, together, make up the village of Saviese. She was 79 years old but robust, still tended to her vegetables and flowers and cane fruits. Just before lunchtime, her husband, Ali, told her someone wanted to see her. She wasn’t expecting visitors, but she wasn’t in the habit of greeting anyone in her gardening clothes. She hurried into the house, changed into a bright blue dress printed with white flowers, pulled her hair back, put on her lipstick. She wore a gold cross on a chain. Two people were at her front door. Journalists, they said, from a Lausanne daily called Le Matin. 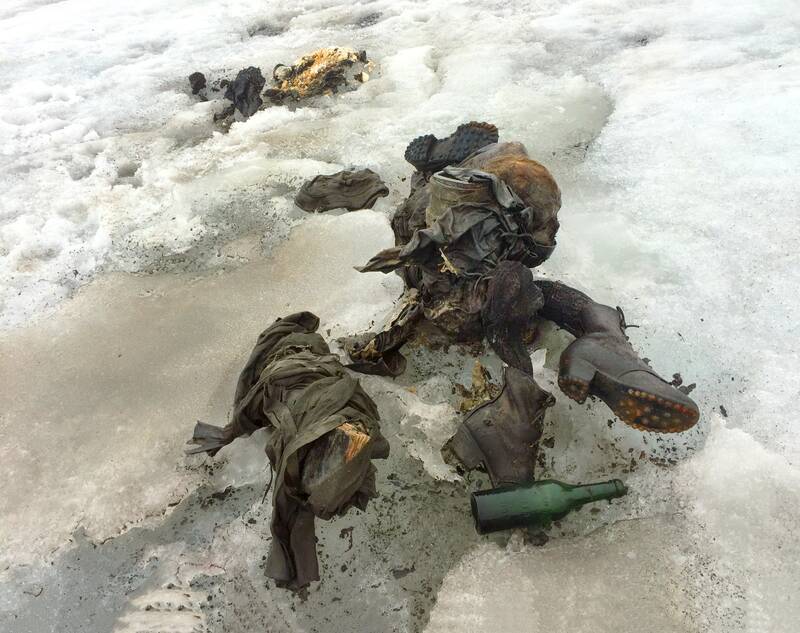 They’d learned that two mummified bodies had been found on the Tsanfleuron glacier, and while there had been no positive identification, they cross-referenced the known details with a list of people who’d gone missing. “We think they found your parents,” one of them said. Marceline was quiet for a moment. Then she whispered, maybe to herself or maybe out loud, Dieu merci. Thank you, God. For 75 years, she believed her parents were frozen on the mountain, buried beneath the ice and the skiers and the snow buses. But she never knew, not for certain, because their bodies were never found. Marceline was 4 years old when her parents disappeared. Her father, Marcelin, was a cobbler, and she remembers how, when his youngest son was 18 months old, her father would rig a hammock in his workshop for him and sing while he stitched and hammered. It was a lilting melody with a martial cadence, and she still knows all the words but not the name. The marching song, she calls it. She remembers, too, another song, one he sang to her, about a vacher who looks after the cows in the meadows. It’s slow and mournful and lovely when she sings it, because it’s about how lonely the vacher is, high in the pastures for months at a time. Her father would have known that song, would have been partial to it, because he understood the vacher. The Dumoulins, like many families, had a cow or two, but they did not tend them. But as president of the local dairy association, Marcelin would check on everyone’s cows once a year. He could follow the pass that the cows took, the Col du Sanetsch, but it was easier, or at least shorter, to go up the mountain and across the glacier and straight down the other side. By the summer of 1942, when he was 40 years old, Marcelin had made that journey, eight hours each way, at least five times, and always alone. That year, though, he decided to take his wife, Francine, who was 37. She was a teacher and every summer before had either been pregnant or nursing an infant—she had had eight children, though only five boys and two girls were still alive. Marcelin and Francine left Chandolin on Saturday, August 15, 1942. That was the Feast of the Assumption, a holy day that most of the villagers took as a holiday. They planned to be gone only one night, so they packed a light meal of bread and cheese and a bottle of lemonade. Sunday evening came, and Marcelin and Francine did not return. Nor did they appear on Monday. On Tuesday, Marceline saw her aunt, her father’s sister, dressed in black and crying, and she did not understand why, not just then. The villagers tried to find the Dumoulins for a few days, then tried to recover their bodies for more than two months. There were reports that a heavy fog had settled on the glacier about five o’clock that afternoon, and it was assumed Francine and Marcelin had fallen into a crevasse. Searchers spread out across Tsanfleuron, and they roped down into the deep cracks, 30 meters by one account. But no one ever found a trace of them. It was as if Les Diablerets, playground of devils and demons, had spirited them away, as if the mountain was still a wicked place. The Dumoulin children were split up among relatives and friends. Marceline and two elder siblings and her baby brother lived with her aunt, the one she’d seen crying. For four years, her aunt dressed the children in black, as was the mourning custom in a very Catholic village. (Due to the deaths of various relatives, her aunt wore black for 15 straight years, including on her wedding day.) Some of the crueler children told Marceline her parents jumped into a crevasse rather than feed all those mouths. But mostly there was sympathy, seven children orphaned by the mountain. Years passed. The siblings drifted apart, never as close as they would have been under one roof. But no one ever forgot. 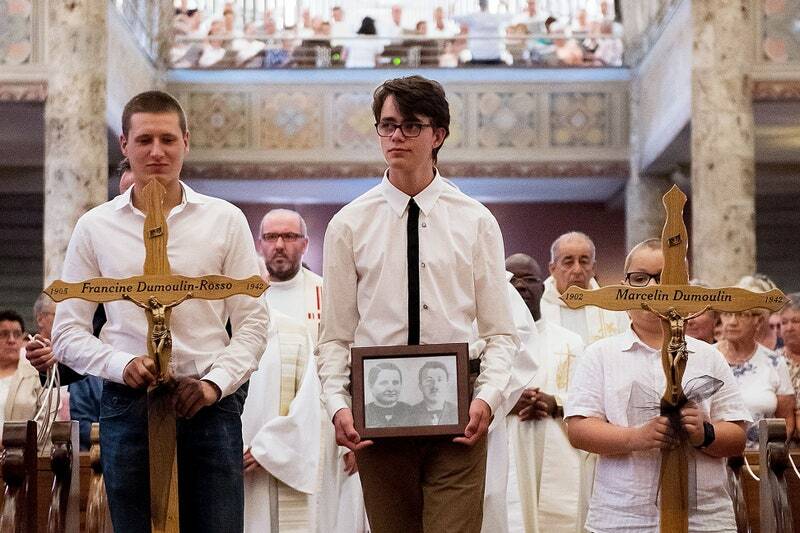 Marceline’s brother Eugene became a priest in Madagascar, but he returned in 1957 to say a Mass at the base of the Quille du Diable, on an altar made of snow adorned with a cross made of snow. Another brother, Candide, searched the massif for years. Marceline rarely went to the glacier. The Mass in ’57, yes, of course, and twice more over the years. She lived a perfectly normal life, married to a man in Chandolin with whom she raised three children in a house with a view of the vineyards terraced above the valley. Still, she never stopped searching in her own way. She is a woman of deep faith who believed God would someday deliver her parents if He saw fit, and as a demonstration of that faith she followed the pilgrimage of Santiago de Compostela. It took her five years to finish, walking only a portion at a time, until finally, in 2013, she reached the end, where, in her joy and relief, she prayed only for God to find her parents. At the top of Les Diablerets, up a stairway from the restaurants and the gift shop, there are two peaks jutting up into the blue of a midsummer sky and, stretching from one to the other, a 106-meter suspension bridge just wide enough for two pedestrians to comfortably pass. The view is breathtaking. Below, to the north, is all green valley and high meadow, with the resort village of Les Diablerets in the middle distance. Farther northeast, amid rough hills and low peaks, is Gstaad, and from the proper vantage point, a sliver of Lausanne cuts across the northwest. Dead south are the blue-gray Pennine Alps, where Grand Combin rises more than 4,300 meters into a misty sky. Tsanfleuron—which is the largest of several glaciers on the massif—has shrunk considerably in the past hundred years, both in area and in depth. Since 1960, it’s retreated roughly half a kilometer, and twice that since 1850. As it is, Tschannen says, the glacier is losing half a meter in a good year, a full meter in a bad one. Snow falls heavy in the winter, though, and by December there should be ten meters packed beneath the loose powder. When the weather warms and the snow thins, there are hiking trails and the suspension bridge and what’s called the Fun Park, a little sledding slope for tourists who’ve never seen snow. Tschannen points out these things from the Ice Express, the lift that runs down from the main lodge in the summer. To the left of the lift, there’s an alpine coaster—a sort of toboggan run on rails—where a giggling woman in a hijab is pulling hard on her brakes as she descends. One of the snow buses is halfway down a long hiking trail, carrying a load of passengers with more sense than energy. The other snow bus is almost dead ahead, taking tourists on a long loop through the middle of the glacier. Jan Theiler is driving it. It’s 60 degrees on the mountain, and Theiler is working in shirtsleeves. I look out over the glacier and ask how many other bodies are under the ice. “None,” he says quickly, confidently. He can’t possibly know that. No one can, not until the top of Les Diablerets is only damp limestone. Perhaps there is no documentation of anyone else who disappeared on Les Diablerets, but records go back only so far and Tsanfleuron has been there for thousands of years. No one knew, for instance, that a well-armed and tattooed fellow, who’s come to be known as Ötzi, bled out from an arrow wound in the Tyrolean Alps 5,000 years ago until the ice thinned enough for a couple of tourists to find him in 1991. And even if Tschannen is correct, Tsanfleuron is only one little glacier in a whole world of warming temperatures. For all their historical value, for every relieved family, each of those discoveries is still horrifying—not because they are especially gruesome or because they are final, definitive proof of individual tragedies but because they are direct evidence of an epic and existential catastrophe. There were never any demons; the mountains were never cursed. There were just rocks and ice and snow, and people didn’t understand enough of anything. But we do now. See that brownish snow? Tschannen points to a faintly beige patch below and to the right. A dusting of sand from the Sahara, he says, swept up in storms and carried on high-altitude winds to Switzerland. And that patch over there, the one sprinkled with something fine and pale red? That’s pollen from an unusually warm and early spring that had all the flowers and trees popping at once. Mostly, though, the glacier is a blinding white, wide and flat and gleaming in the summer sun. Yet in a few places, it’s streaked with turquoise, like brushstrokes the color of a shallow Bahamian bay. That’s where the meltwater cuts to the surface before it slips back under the ice. It reappears at the bottom of the alpine coaster, after it’s washed around whatever lies beneath, then sprays over the edge of the cliff, fine and frothy droplets that gather into a stream and fall away forever. One month and two days after Jan Theiler found the Dumoulins on the mountain, Marceline went to the glacier one last time. It was August 15, 2017, the 75th anniversary of the day her parents disappeared. She was with her husband, Ali, and her daughter and some other relatives, and they rode the snow bus to the hole left in the ice where her parents had been cut out. It was a brilliant day, a cobalt sky over the gray peaks to the south. She stood there quietly, looking out over the valley, then into the hole, then into middle space only she could see. She began to sing, softly but clearly, lyrics unspooling from long-ago memories. It was slow and mournful and lovely, a song about a vacher who’s been in the mountains alone for too long. Body Parts – Is it time that we renamed female body parts? Next story Art World – How Does the Art World Live With Itself?